There are many options available over the counter products and home remedies to treat rosacea while in the prescriptive space there are the standards like gels, creams and antibiotics that are typically issued to rosacea suffers at diagnosis. Over time many with rosacea find that they need to integrate other rosacea products and treatments such as over the counter nutricuticals, natural treatments and experiment with multiple rosacea skin care products to find the right mix that helps them to treat and manage their rosacea. It’s often frustrating and costly to the rosacea sufferer to find the right blend of treatments that works for them as each person and their rosacea is unique. So where do you turn to learn about the different rosacea products, both new, from your doctor and even home remedies that have worked for other rosecrans? Welcome to a series of articles where we will review available rosacea products new and currently on the market. (1) Plexion™ Cleanser. Plexion is a 10% sulfacetamide, 5% sulfur foaming face wash with high levels of emollients and low irritation potential. Several ‘new’ penetration enhancers have been added to this rosacea treatment product to penetrate deep into the pores and skin surface to treat inflammation, papules, pustules and several common coexisting skin disorders such as acne and seborrheic dermatitis. The treatment actions continue for hours after the cleanser is washed off. Comments: This is an excellent treatment option for rosacea sufferers because they can get a deep cleanse with plexion while delivering active anti-rosacea ingredients that work for hours after the cleanser is washed off. (2) Benziq LS Gel™. Benziq is a unique low-strength gel (LS Gel) containing 2.75% micronized benzoyl peroxide that is an excellent choice for rosacea treatment. The base ingredients are key to this product’s effectiveness, anti-irritant actions, and strong moisturizing actions. This prescription contains high concentrations of hyaluronic acid, allantoin, panthenol and glycerin, all excellent moisturizers and anti-irritants for hyper-reactive rosacea skin. Comments: Most benzoyl peroxide products are not recommended for rosacea skin. This is a novel prescription that should be suitable for most rosacea sufferers with papules, pustules and breakouts due to the deep penetrating micronized benzoyl peroxide, the delivery system suitable for sensitive skin and excellent hydration that this topical treatment gel imparts to rosacea skin. (3) ClariFoam EF™ Emollient Foam. Clarifoam is a novel 10% sulfacetamide, 5% sulfur developed with a new foam delivery base (DelevoFoam™ base). DelevoFoam™ is gentler on the skin than normal lotions, creams and gels, increases penetration of the active ingredients and does not disrupt or irritate the dermis. This treatment targets papules, pustules, clogged pores, coexisting acne, and seborrheic dermatitis. This can be used several times a week as a thicker “mask” treatment or every night for daily treatment and prevention of symptom recurrences. Comments: The new foam delivery base and gentleness of this new product make this a top choice for rosacea sufferers with moderate-to-severe rosacea or those who cannot tolerate topical rosacea treatment products. (1) Rosadyn™ Oral Nutraceutical. Rosadyn targets the root causes of rosacea, deep within the skin tissue. Visible symptoms of rosacea and other skin conditions represent only “the tip of the iceberg” for most – the underlying cause of facial redness, burning, breakouts flushing and the distressing symptoms rosacea sufferers experience begins deep in the skin and body where they are not visible to the naked eye. Unlike topicals that claim to treat rosacea but just address the superficial symptoms of rosacea, Rosadyn’s oral delivery targets the root causes of the condition, beneath the skin’s outer layer targeting rosacea from the inside out. Comments: Rosadyn is an excellent treatment for all facets of rosacea because it addresses multiple underlying causes such as blood vessel dysfunction, skin inflammation, and flushing triggers. Consistent with this, Rosadyn’s “Vascular Support Blend™” has been shown to repair damaged skin vessel walls and protect blood vessels from free radical and inflammatory damage. Together, these ingredients address inflammation-induced blood vessel growth throughout all layers of the facial skin, supporting a reduction in excess blood flow, flushing responses and redness. Furthermore, Rosadyn’s “Skin Support Blend™” incorporates some of the most potent oral antioxidants available today. These ingredients seek to neutralize harmful free radicals, one of the central problems identified in rosacea. Individually, these ingredients have been shown to mitigate inflammation, inhibit free radical formation, reduce skin redness and thicken and moisturize the skin from the inside-out. 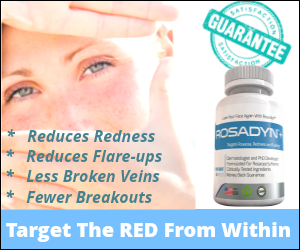 Lastly, Rosadyn’s proprietary “Hypothamic Blend™” has been shown to significantly suppress key rosacea triggers. Stress and anxiety are often key precursors of rosacea flares. As such, the ability to control them can have a positive impact on both the strength and frequency of rosacea flaring. The Hypothalamus Support Blend includes ingredients which have been shown to lower stress and anxiety responses in the brain, resulting in a naturally calming effect that produces relaxation without drowsiness. (2) Natragel™ Hydrogel Mask. NatraGel™ is a unique hydrogel system used to calm, cool, soothe, hydrate and moisturize the skin. Because of its occlusive properties (the ability to lock in moisture), NatraGel forms an efficient dermal delivery system that is able to deliver hydration and nutrients to the skin. Comments: This is an excellent product for rosacea sufferers due to its ability to cool the skin, reduce redness, constrict superficial blood vessels and suppress flushing episodes. These are best kept in a refrigerator for added cooling action. The Natragel Mask comes in two forms: (1) A mask enriched with Green Tea Extract, Chamomile and Aloe Vera for added anti-redness actions and anti-aging effects on the skin and (2) A pure water form for sensitive skin. These can be purchased at Spa Centers or located through their site. (3) RosaSkin’s™ Pure Sea Buckthorn Oil. RosaSkin’s cold-pressed Sea Buckthorn Oil has several qualities that make it an excellent choice for treating rosacea skin. This is a light oil that moisturizes dry, taut rosacea skin while delivering ingredients that reduce the production of inflammatory prostaglandins and cytokines found in high levels in rosacea skin. Comments: Used on a daily basis this product not only moisturizes skin and reduces superficial skin inflammation, but it interferes with the Demodex reproduction cycle (larvae hatching), slowly resulting in lower numbers of Demodex in rosacea skin. (4) RosaSkin’s Pure Manuka Honey Treatment Mask. RosaSkin’s Manuka Honey Mask was developed based on scientific and clinical studies that demonstrated that certain strains of honey have calming actions on rosacea skin and can thicken the outer layer of facial skin cells through local rejuvenating actions. Comments: This product is best used one to three times per week to strengthen weak, inflamed rosacea skin. The feedback on the effectiveness of this product have been excellent and is well worth a trial. (5) Rosacea Care™ Colloidal Oatmeal Cleanser. Rosacea Care’s colloidal oatmeal cleanser which contains whole oats ground into an extremely fine, silky powder, is a favorite among rosacea sufferers due to its ability to cleanse skin and pores thoroughly while calming rosacea-sensitive skin. Comments: This cleanser contains high-grade colloidal oatmeal that can be used as a cleanser or a mask to reduce facial sensitivity. (1) Soothing Cucumber Mask. Rosacea sufferers and dermatologists alike have found that fresh cucumber, blended into a facial mask, may help to reduce rosacea symptoms such as facial redness, skin hyper-sensitivity and swelling. This natural homemade treatment is a highly effective option for rosacea sufferers. Comments: Peel and puree a fresh cucumber with 1 egg white in a blender. Gently smooth the resulting mask over your face, and leave it in place for a half an hour. Once the mask has set, rinse the face thoroughly with cool water. In general, rosacea sufferers should notice results within a month of daily use. (2) Anti-Redness Chamomile Compress. Chamomile is one of the best topical anti-inflammatories for rosacea skin. The most effective form for rosacea is Golden Chamomile (German Chamomile) due to it’s high levels of anti-inflammatory polyphenols. A gentle compress with chamomile oil may help to reduce the inflammation and redness associated with rosacea. Comments: Steep several chamomile tea bags in a quart of hot water. Cool the resulting mixture in the refrigerator. When you begin to feel a flare-up, dampen a soft cloth in this mixture and apply it to your face for 15 to 20 minutes. Have you tried a rosacea treatment product or combination of products have provided you relief from rosacea’s annoying symptoms? We would love to hear what your experience with managing your rosacea. We find that many rosacea sufferers are using a combination of products both prescription and over the counter treatment solutions. By sharing what has worked for you in our comments section together we can help other rosacea suffers find relief from rosacea’s annoying symptoms.